Details are now emerging over how national carrier Kenya Airways lost over Sh13billion in an offer to purchase aircraft bought under the Mawingu project and which are now rendered redundant. During an appearance before the National Assembly Transport and Infrastructure committee and the Senate committee on Kenya airways inquiry, Acting transport Cabinet Secretary James Macharia said the airline was now making fresh attempts to sell off at least four aircraft which were grounded as the costs of operating them were high. “We have spoken to the management and they are selling four aircraft; some of them 777 and also some of the 737s. We are trying to see that this is done as quickly as possible but chair you should know that selling an aircraft is not like selling a car, it takes a long time… this is coming at a time when most airlines are no doing well,” said Macharia. Transport Committee Chairman Maina Kamanda revealed that he was privy to information over how an offer to purchase the four aircraft had been rejected by the airline after the company that had expressed interest declined to pay kickbacks to the tender committee. “You need to get the information right and get to know that the four aircraft at one time had been advertised for sale and got the highest bidder, but because some people who requested a commission did not get it, they cancelled the deal. They advertised it after a few months and got half of what they got at that time,” said Kamanda. Macharia said the matter was public knowledge but however declined to go into the details saying they were investigating it and within two weeks, the ministry would pronounce itself over what transpired. 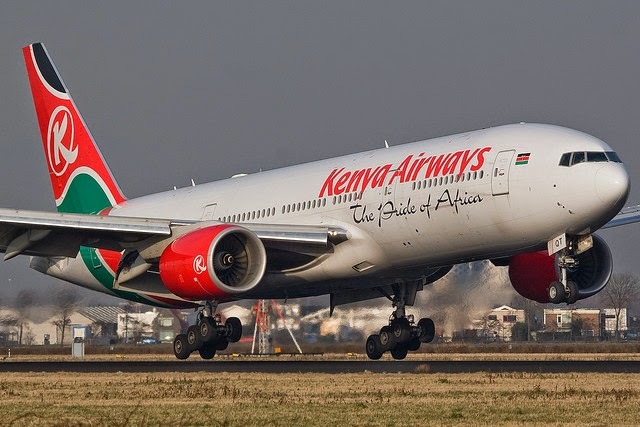 During an earlier appearance by the Kenya Airways management, the same issue emerged that the airline had an initial offer of $322 million (Sh33 billion). However the airlines’ Finance director Alex Mbugua said the best offer they had received now was 185 million dollars (Sh19 billion). Macharia said he was working with the National Treasury to investigate cases of financial impropriety as a forensic audit of the company’s books told a different tale adding those found guilty would be penalised. “The balance sheet has a lot of queries and need to be investigated; the assets and liabilities do not match the revenue,” said Macharia. Macharia who is the substantive Health CS pointed out that his ministry had since cleared the routes that had been restricted due to the Ebola epidemic and had since advised the airline to re-open those routes. Macharia disputed the proposals to have the government shares increased saying in the airline industry which competitive and risky, the perils will be higher if the government had more influence because the decisions are likely to be politically motivated. The day saw the Cabinet Secretary find himself in the middle of the ‘sibling rivalry’ between the Senate and the National Assembly when Kamanda directed him not to appear before the Senate as the matter was not part of their mandate. The CS however honoured the summons with Nyeri Senator Mutahi Kagwe leading the onslaught against the Lower House saying they were yet to mature and understand how a bicameral Parliament works. “The issues we are facing are out of ignorance and immaturity. As in other bicameral jurisdictions that have matured when one House starts a special committee on something, it is very unlikely that the other House will investigate the same thing, as we mature here, we hope this happens,” he said. We cannot afford to let KQ go down but bailing it out does not mean the Government of Kenya putting money in the table. There has to be a plan…we have to be smart because the government now cannot raise the Sh60 billion as we stand. He said there was a need to have a long-term initiative to rescue the airline adding that the most important factor was to have the airline paid its debts first.